Tired having to locate a baby sitter, battle the crowds, and waiting in line at your local Cineplex? Would you like to enjoy the benefits of the best commercial theaters – incredible picture and sound, comfortable seating, and stylish architecture – but in the privacy of your own home? Would you like to add something to your home that will provide a shared activity the entire family would enjoy? Home theater is what you need! With custom-designed home theater systems from LowVoltex, you can own the theater! With the latest technologies like digital front projection, HDTV, Dolby Digital, and DTS surround sound, you can have a theater in your own home that eclipses the best cinema in town. 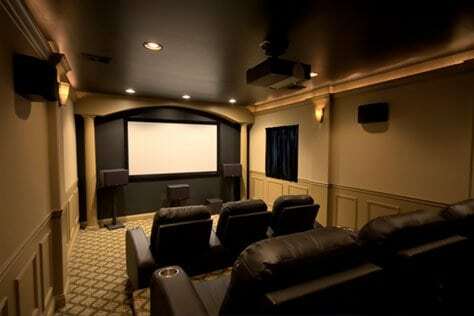 We can design, engineer and install your entire home theater! We can supply and install anything from mild to wild! Forget about the pile of remotes to control your tv, that is a thing of the past once you’ve had LowVoltex at your service. Image after just one press of a button from your wireless touch panel, having your lights dim, projector turns on, A/V receiver turns on and goes to the appropriate input and surround sound mode, DVD player turns on and starts to play and now the curtains open up in fron of the room to reveal a 120” widescreen that provides a perfect view to all of your family and guests enjoying this amazing experience. All form their comfortable leather recliners placed stadium style. All you had to know to make this happen was what you wanted to watch! The possibilities with home theater systems are endless.